Kenneth James Gibson is a man of many different personas. The list of his releases over the past years is way too much for this infosheet, so let’s skip this part for now. Under the moniker of [a]pendics.shuffle he’s visiting Mo’s Ferry Prod. for the third time. „You Got My Harmony“ is not only a title for this EP. You can take this phrase literally. His sound fits the label like few others. 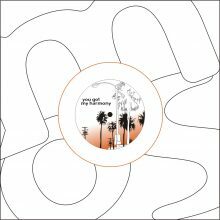 Along with his two extremely grooving tracks „Finding Harmony“ and „You Got My“ the package also contains two remixes by Tim Xavier and Olene Kadar. They definitely share our faible for „Frickelsound“. Tim turnes the original track in a dry, more driven techno version. Olene – with young ambition and restlessness – starts quite relaxed, but carries his arrangement of the given samples to the extreme, again.